With assistance from the North Carolina Office of Rural Health and Community Care, Vidant Chowan Hospital (VCH), located in Edenton, North Carolina implemented a ‘No Patient Left Behind’ transitional health program, a free service through which patients with chronic obstructive pulmonary disease (COPD), diabetes, post-acute myocardial infarction (AMI), congestive heart failure and pneumonia are helped to transition back to their home upon discharge. During the home visits, nursing staff educated patients about their medications, diet, exercise and healthy lifestyle options. Nursing staff worked with physicians to obtain needed referrals or find a physician if needed. Assistance with other needs such as Meals on Wheels, transportation, diabetic supplies and new eyeglasses was facilitated by the visiting nurses. 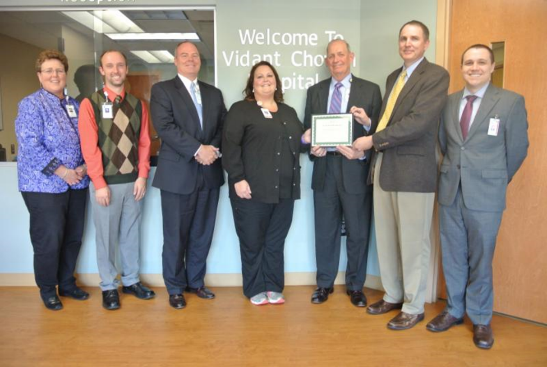 This project has been successful in large part due to the leadership and support provided by the dedicated staff of Vidant Chowan Hospital.